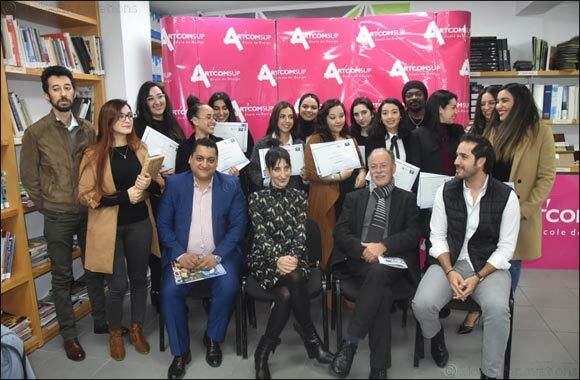 United Arab Emirates, Dubai , 17 January 2019 - As part of its ongoing efforts to support and invest in university students, GROHE, the world's leading provider of sanitary fittings, partnered with Art'Com Sup School of Design to introduce for the first time in Morocco the GROHE Design Series program. Three winners were announced during the final ceremony, headed by Lina Varytimidou, Director of PR and Communications at Grohe, East Mediterranean, Middle East and Africa, in the presence of university senior representatives and students. The regional program was launched by GROHE in 2012 to encourage, support and reward the successful creations of university students in the field of design. Launched in Lebanon and rolled out in many countries including Turkey, UAE and Egypt, the program aims at providing students with opportunities that challenge and maximize their individual talents while promoting lifelong learning. The program kick started with an introduction of GROHE's latest innovations in terms of quality, technology and design within the bathroom and kitchen industry. Attending senior students from Interior Design and Digital Graphic Design departments had the opportunity to discover GROHE's latest trends and were introduced to the programs flow in preparation for the Design Series competition that extended throughout the academic year 2017-2018. Through the competition entitled ‘Cultural Relevance of an International Brand,' Art'com Sup students were assigned to develop a home spa using the GROHE GRANDERA range. Students had the chance to exchange ideas, design and develop a project with the help of experts from GROHE to generate avant-garde design ideas. “We would like to thank GROHE for selecting our university to bring the Design Series for the first time in Morocco.” Said Zahia Benabdeljalil, Director of Art'Com Sup. “Design Series is a very high-level professional experience for our students, challenging them to improve life quality through the Design. We trust our students' innovative ideas, creativity and passion and we are very proud of the results”, she concluded. After months of interaction and discussion, the panel of judges selected three students to receive a prestigious summer internship at various locations of GROHE, all expenses paid for as the grand prize. “We are extremely happy with our collaboration. The work that the students have submitted has been truly inspiring and has instilled our confidence into the future generations of designers in Morocco”, concluded Lina Varytimidou.